Having an HTTPS certificate on your site has many advantages. Among many other advantages, having an HTTPS certificate can make it more secure for your users and now will give your site better SEO. This article will discuss how to setup a free Let’s Encrypt HTTPS certificate on your website either Debian or Ubuntu. 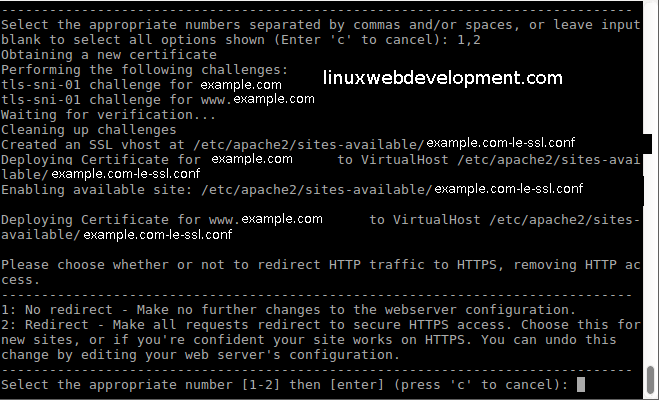 This article assumes that you have control of your server and that you host your site using Apache. We will describe step-by-step how to setup your certificate. Also, throughout this article, we will assume that are setting up the SSL certificate for example.com. Note: if you already have a Let’s Encrypt certificate and you want to renew it, you can read our article here about how to do that. You can learn more about Debian backports here. HTTPS uses port 443 by default, so your firewall must allow port 443. If you know that your firewall already allow port 443, then you can go on to the next step. Otherwise, read on. If you use a different firewall, look up how to open port 443 and do so. 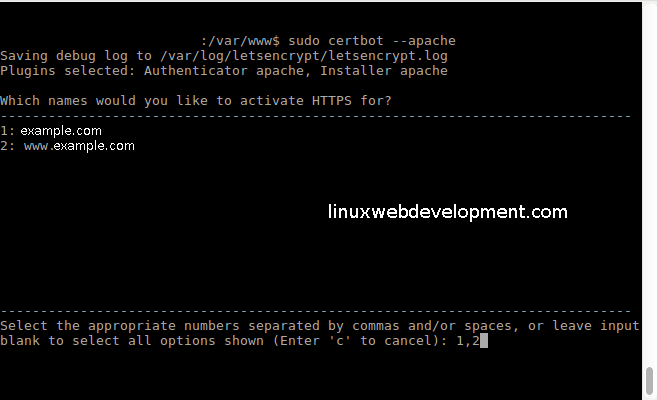 Now, after having installed certbot and made sure that port 443 is open, we will not create the HTTP certificate with certbot. Here, you will chose both the domain and any subdomains you want to have using HTTPS. Next subpart: Choose whether you always want HTTPS or will allow users to choose between HTTPS or HTTP. “Please choose whether or not to redirect HTTP traffic to HTTPS, removing HTTP access. Option 2 will redirect all to HTTPS. So if the user entered in http://example.com, the server would recdirect it to https://example.com. Choose option 1 or 2 and hit enter. You can go to https://www.ssllabs.com/ssltest/analyze.html to check how good your certificate is. The commands we have done in step 3 will actually edit your Apache config file for the site and add an additional config file for the SSL version of your site as well. Just look for HTTPS and some icon looking like a green lockpad.